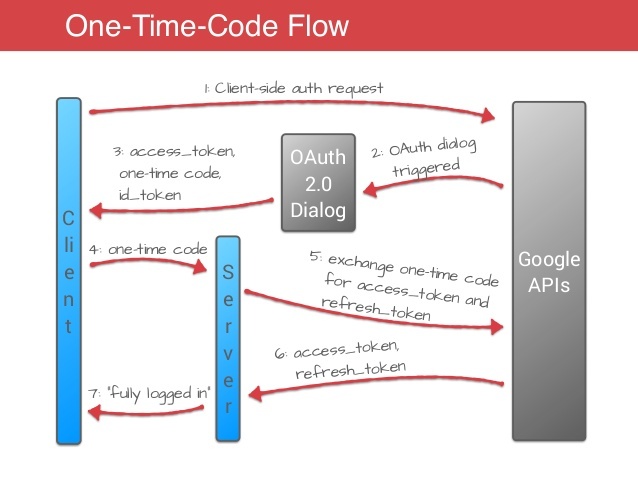 This hybrid authentication flow has significant functional and security advantages over a pure server-side or pure client-side flow. This flow is immune to replay attacks, and conveys no useful information to a man in the middle. I haven't been able to find any explanation on the web about why this is so, or how it is superior to purely server-side OAuth 2.0 authentication. Most material seems to talk only about the mechanics of various OAuth strategies. More specifically, what I don't understand is this: if it's the same information flowing between either client/server/auth provider or just server/auth provider, then isn't either strategy just as susceptible to attacks? So as you have described, a "Hybrid Authentication" is a middle solution between pure server-side and pure client-side authentication. That means that all the tasks that are involved to get an authentication complete will need both the server and the client. So this exchange here is immune to both replay attacks and doesn't provide a MITM with any useful information, because even if the attacker intercepted any packets, he will still have to get that state variable and process the appended code through the server. In contrary to the pure server-side implementation where all the attacker has to do is to send the code to google in exchange with the access token and the refresh token. Here is also a picture to put things into perspective, hope that the difference is more clear now. Not the answer you're looking for? Browse other questions tagged oauth or ask your own question.